The Squire was a very nice man, a great friend of mine, and very tall. I liked him very much and I was shocked when he died in 1935 because he was really part of my life. Everything I did was to do with him and I think he was very fond of me. He married his first wife Elizabeth Maclaine of Kyneton House, Kington, Thornbury, in 1882, but sadly she died in April 1883, a few days after giving birth to their first child Morris, who also died. His second wife, Beatrice Richmond Smith from Bristol, whom he married in 1885, was very nice but she went a bit queer and she eventually committed suicide. She went to live in Bristol in a place called Moorlands (Hardwicke's house at Sneyd Park in Bristol overlooking the Durdham Downs). But he hated everything to do with Bristol and the Downs. He was a countryman through and through, and used to be bored stiff in Bristol but he had to go there because she wouldn't live in Tytherington. She disliked their house, The Grange. After Beatrice died in 1926 the Squire married Winifred Lea in March 1928 who was a companion to his third daughter Margaret. She was quite nice then but her old poor father pushed Hardwicke into marrying. I remember he called me up and said bring the car to Moorlands. He said 'What do you think? You won't believe it, I'm going to get married today.' I said 'Good Lord, who are you going to marry then?' I never dreamt it was her. 'Don't you approve?' he said. I couldn't care less about it but I said 'I'm really surprised'. He was surprised and I think he would have loved to have got out of it. But her father pushed him, forced her to make him marry her. I never liked her. She spoilt him for me because we used to go all over the shop with him – down to Wales, but then I had to take her. But it didn't last long (seven years) because he died not long after. Canon Kitson moved from the Vicarage (The Manor) to the new Vicarage up on Stowell Hill, Hardwicke bought the Manor, he'd always had it in his mind to buy it when he knew the vicar was leaving. He always wanted to get out of the Grange. He wanted to convert the vicarage into a small manor house. But it was a long time before he attempted to do it, and a builder from Henleaze was given the job. The alterations went on for months and months. They filled in the large pond and emptied out the old cess pit at the bottom of the garden of the Manor House. Hardwicke was born with money. He was Welsh and the family were very wealthy. I used to go down with him quite often before he married his second wife. We used to stay at the loneliest place you ever saw. Two old aunts of his we used to see, real gentry they were, and they made a terrible fuss of him. It was a beautiful place with a river running through the garden, and I used to sit there and watch the trout. 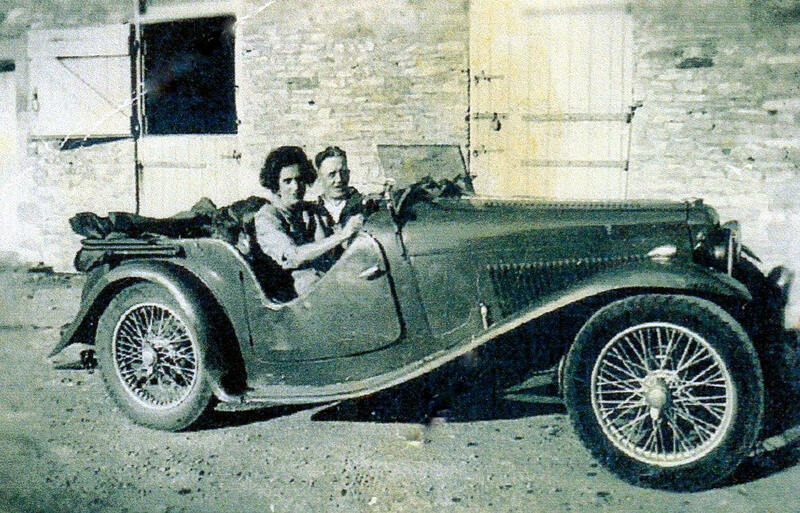 Hardwicke's daughter Eleanor's husband Herbert Davies-Evans came from over there, near Lampeter. He was a banker but went broke and Hardwicke lent him money to help him. Mr Hardwicke's family were the gentry of Wales, they lived in beautiful houses, but they were nice people, they had no side to them. Eleanor went to Wales to live with her husband. They were beautiful girls Eleanor and Daphne, but especially Eleanor. Near end of the First World War I was at Bulford Camp waiting to go to France. Daphne came to see me but I was out. When I got back to my hut all the other chaps were saying 'My Gosh you've had a beautiful lady come to see you. It was Daphne but I never saw her. She brought me a great boxful of cigarettes. She married Major Benjamin Herbert Piercy who owned a great deal of land in Sardinia. He was a nice man, very nice to me. When I drove him to the station it would always be a couple of pound tip. Oh, the porters were always waiting for him to pass by so they could carry his luggage. He never gave out nothing but pounds even in those days! He was a member of the Great Britain Royal Aero Club and in 1914 passed his Aviators’ Certificate. He died on the Isle of Wight in 1941. Daphne lived until 1971. They had one child a son Benjamin James Ernest Hardwicke. Although he was born with money Hardwicke made big profits from the quarries before the First World War, but in the late 1920's and early 1930's Hardwicke's quarries weren't paying and he got into financial difficulties. He lost a lot of money, it was a 'slumpy time'. After the war it was hard going. Hardwicke was one of those men who looked after his old workers. He was a real nice bloke for real old workmen, men like old Pontin. We often used to pick him up in the car and he'd say 'Dun't he go easy, sir?' He was losing money like nobody's business at one time but he would not let people like old Ponting go, he'd keep 'em on whatever happened. The manager would say let’s get rid of them. No, no he wouldn't have it and he got at logger heads with the management, really, because he was nothing in it, only a Chairman, you see. It was run by these other people. Mr Hardwicke didn’t like people that were showing off. He was brought up in a different world to what we were. 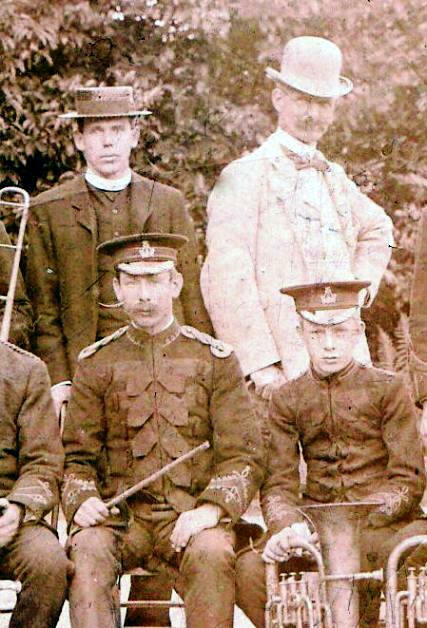 He didn’t inherit at Tytherington until he was quite a young man you know. He never even knew much about it before. I don’t think he even knew he was going to have it. Mr Hardwicke was instrumental in getting the railway done, his pressure. Also he was determined to get piped water to the village because his daughter Daphne got typhoid. He paid for the water to be piped to the village. A number of people died in 1898, I was born in 1897. They say it was water drainage from the churchyard. Mr Hardwicke was like a father to me. He was a gentleman who didn't know any different. He was brought up as a gentleman and he believed in people having a fair deal. I wanted to start up a garage at Malt House on Duck Street. Mr Hardwicke said if you want me to make a garage for you I'll clean out the barn and put big double doors on it. (In 2015 that barn was converted into a residence). That's where I used to work and I did very well. In 1920 I had the petrol pumps. I had the garage for several years but we came into the slump and nothing paid, you couldn't make any money. People couldn't pay me so I gave up. Mr Hardwicke had a car converted in Bristol, unbeknown to me, into a lorry! Covered in front so just two of you could sit in it. We went all over the place in this blooming truck. Now and again he’d send out, because he was living in Bristol in them days and he’d say ‘Tell Alsey I want him to come with me down to Wales’, and we used to go off. I loved that. Mr Hardwicke had a cleft palate and lisped. He’d tell me to talk to people, and that’s a lot of why I got on well with him. He looked on me as a sort of helper with his speech. Mr Hardwicke was living in the Manor House, Tytherington when he died in 1935. I was living in the bungalow (just above what is now the Jays). His old butler came up and said you better go and get Dr Macwatter at Almondsbury because he's very ill. So I took his daughter Daphne's Rolls Royce and fetched the doctor. Later I came over and the doctor was sitting eating a boiled egg in the dining room. I said 'Is he better?' He said 'No, he's gone'. I couldn't believe it. The old butler had given him a boiled egg and he was scoffing it. I think the doctor had given him an injection and that finished him off. He had a heart attack, he'd suffered with his heart all his life. He had several falls, especially since he used to ride a lot. He nearly broke his neck and was on his back for a long time. I used to do all sorts for him... shaving, massage. He used to have a wonderful massage man, Mr Stane, I used to fetch him from Henleaze in Bristol. Mr Stane cured me once when I had a frozen nerve in my face. Dr Grace, my doctor, said I'd never be cured! Photos above show Squire Hardwicke with Rev. 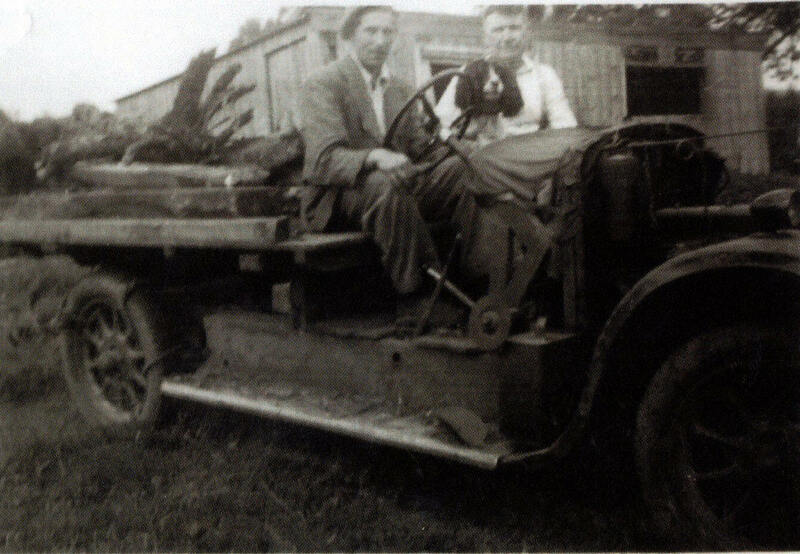 Arkle and the Tytherington Band; Hardwicke's Singer flat bed truck with Dave Niblett at the wheel with Austin Livall; and Alsey Curtis and his wife Phyllis in their Singer sports car.